This addon for Kodi is very specific and will be useful only for businesses that use Kodi to stream content. I.e. bars, coffee shop, restaurant, club, dentist office, travel agency, etc. What it does is that it displays ad-banners over playing video. You can make your own banners in jpg or png format (png supports transparency) and have them displayed in a cycle over video. Whenever this add on detects playing video, it will display rotating ad banners. There can be unlimited number of banners. These should be located in add on's userdata folder, i.e userdata\service.banners\mybanners. You can specify the time delay between banner change and pause between banner cycles. So i.e. 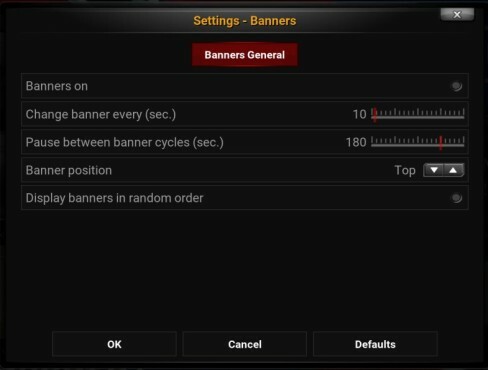 if you specify banner change time 10 seconds, and 30 second pause, all banners from mybanners folder will be shown with interval of 10 seconds, and upon showing all banners, no banners will be shown for 30 seconds, before it starts again. The banners can be displayed at the top or bottom of the screen. Banners are resized to fit only height, the proportions of the banner are retained. Banners are always centered horizontally. In order to install it, first install my REPO, then install add-on, and copy own banners to the userdata\service.banners\mybanners folder.